← Lola Zola Lives in a Candy Store! Either way, it’s bad news. How will Lola rescue her parents and tail-less cat Bowzer from the jobless blues? Then the idea of all ideas hits her square in the noggin like a lemon seed spit at one hundred miles per hour: a lemonade stand! Lola goes to work with the squirt and slurp assistance of her best friend, freckle-counting Melanie Papadakis. When Lola’s class rival — Charles Wembly III aka, Slime Bucket—hears what the twister sisters are up to, he opens his own limo-nade stand out of the back of his father’s limousine — right across the street from Lola. It’s bad enough Lola’s mother might go to work for Slime Bucket’s father — Mr. Stinky Breath. Now, Buck is stealing her customers with an aggressive ad campaign. A serious game of one-upsmanship, “corporate” chicanery, and worker rebellion ensues—turning the town of Mirage upside down and sideways. 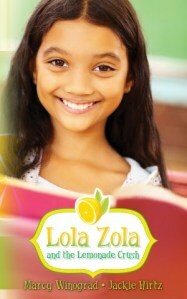 One exaggerated claim leads to another until word spreads that Lola’s lemonade has secret powers. Can it really erase wrinkles, cure allergies, and promote world peace? Intrigue and spy organizations run amok until closely kept secrets are revealed and Lola must decide what it means to win. Just when Lola is about to declare victory, she discovers Buck isn’t the enemy after all, and may even be a friend — if not a crush! Is this possible? Let’s just say anything can happen in a desert town called Mirage.